Meanwhile on Stardoll: Red Lips And makeup! 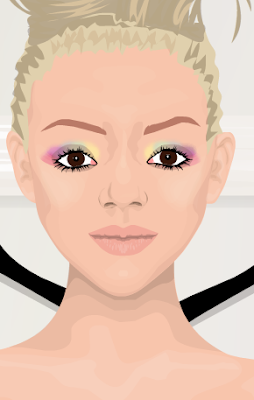 The rainbow eye makeup trend is pretty hot right now, on the runway and on SD. 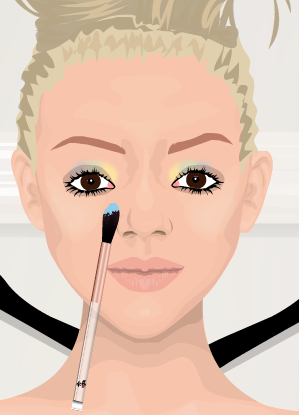 I will teach you how to snag this trend and play up your eyes with a pack full of colors. Before you start make sure your medolls hair is clean and not in the way of your eyes. First, we start the rainbow from the inner rims of the eyes; I'm starting with yellow. 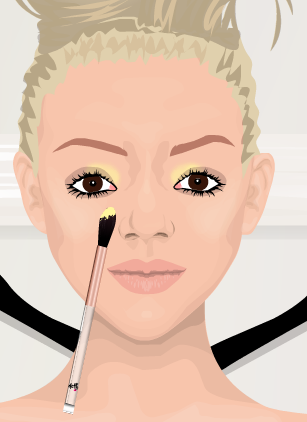 Take your candle light shade stick/eyeshadow and coat your rims with the yellow. Do not go all the way to the outer rims. Next pick up your sky eyeshadow or any shade of blue shade stick you desire, although it works best with light blue. Cautiously and carefully apply it next to the yellow, and let the two colors blend in a little. Do it lightly otherwise it would be thick and would look awful. If you did it carefully enough there would be a hint of green in the middle. Blend in with blue by adding purple - take your lavender eyeshadow and again, carefully apply it. Now for the interesting part - more color! As you've noticed, I've applied my makeup lightly, so now I bring out the big guns - those shade sticks in eye-popping hues! I've chosen electric pink and bright purple. And wala, you are done! Here's a note: you may use different shades of colors - the more lighter the colors are, the more softer your whole look in general is. The more bright the colors are, the more eye-catching it is. Good luck! LOVE IT!! Thanks for the tutorial! !